Dimensions 0.25 by 7 by 5 in. 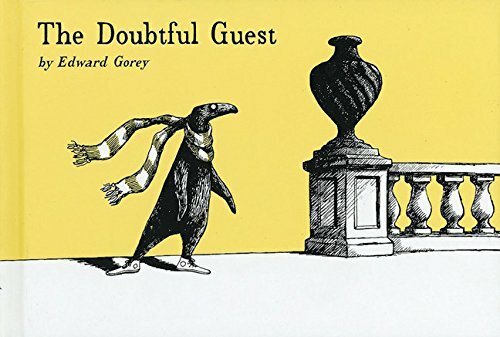 Told in a set of fourteen rhyming couplets, The Doubtful Guest is the story of a solemn, mysterious, outdoor creature, dressed rather ordinarily in sneakers and a scarf, who appears on a winter night at a family's Victorian home and never leaves again. Gorey's eerie and charming illustrations accompany the verses, making this an enjoyably strange (and strangely enjoyable) read for all ages. About: A tale of deceptive simplicity.